After fussing with a couple of brief videos I made on the streets of Hoboken two weeks ago, I tried to compress three or four of them into a five-minute video for the blog. Lo and behold, the video is too big to post! So I've broken them back apart, and this, the first, will be part of a series--a series of short shots of my neighborhood. Hope this will work--there's more to come. It was warm and sunny the other day, and the birds were singing like maniacs. Spring was just about to break forth in full blossom, and it felt good to be alive. I walked to the gym in just a light jacket, not my usual sweatshirt, heavy coat, and gloves. I saw a few crocuses in somebody's tiny front garden. It's March in the Northeast--which means a little more cold weather, some nasty rain and wind, but the promise of spring in the offing. I left Lower Alabama a year and a half ago, where March is spectacular. It's too soon to be really humid, and the azaleas and Japanese cherries are in full bloom. Temperatures are in the 70's. Everybody is happy. I used to hate March when I lived in New York City in the 1960's and 70's, because I was haunted by memories of glorious March in the South. I couldn't get used to the rain here. Rain in Alabama is gentle and almost warm; it doesn't hit like icy bullets whipped from one side to the other. It just surrounds you, lazily, like a veil of benign moisture, saying, "Pardon, me, ma'am, I'm just here for the grass and flowers." The azalea bushes, big as small buildings, are covered in their bright pink blossoms. Here and there are blooming trees--redbuds, dogwoods, and fruit. March brings bitter-cold rain here. But as you acclimate to the change of seasons, you appreciate March in particular. It will be spring tomorrow. (I know, they say the 20th is the first day of spring, but I remember when it was the 21st and it will always be the 21st to me. Besides, it won't really begin to warm up until next week.) We have had some pleasant days already. The leaves on the trees seem to be thinking about breaking out. Those crocuses have already made their statement. And March is almost over. But I just looked out the window, and it's snowing! I wrote this post a year ago, my first real St. Patrick's Day in Hoboken. It's pretty good if I do say so myself, but I have one thing to add about that last sentence. I did indeed search for a place for a genuine Irish coffee, the kind you find in Dublin (or probably New York City), but was disappointed in Hoboken. Beer seems to be the drink of the Irish here. I found a pleasant spot at the bar at the Elysian, asked if they served Irish coffee, and the bartender said, "Sure." He poured a cup of indifferent coffee, added a slug of Bushmill's and some cream, and served that to me. It was hardly what I longed for, but I had to accept it as Irish coffee. Maybe I'll have better luck this year. Because it's you-know-who's day and all that, and because Hoboken takes it upon itself to celebrate the day beginning two weeks in advance, I am driven to record some stuff about Ireland and the Irish. In Hoboken, they may even need to be reminded that this is actually St. Patrick’s Day. I could praise Ireland’s homely, soul-filling food like corned beef simmered for hours with cabbage and potatoes or caraway-scented soda bread, or its heart-wrenching characters like those portrayed in the classic film The Quiet Man (rent it if you haven't seen it yet). Even world renowned institutions stumble from time to time. Since the turn of the last century, the English-speaking stage has been sparked by the talents of Irish writers. From John Millington Synge and Sean O'Casey (and those with Celtic roots, like Oscar Wilde and George Bernard Shaw) through today's Brian Friel, Hugh Leonard, and Conor McPherson, we have the Irish to thank for many evenings of unforgettable theatre. At my own theatre in South Alabama, Jubilee Fish, many remember our haunting productions of Da, and the poetic Sea Marks by Gardner McKay, presented in the 1990’s. This was before I appeared in Fairhope’s Theater 98 production of Dancing at Lughnasa, playing the role of Kate, the elder sister. This one was directed by a man whose name is quite similar to Sean Thornton, the John Wayne character in The Quiet Man. When left to their own devices, the Irish have lots to give us besides potatoes and shamrocks. Just writing this, I am hearing the lilting Gaelic music that has become so popular in the last ten years, and I think of all the Irish singers of Irish songs over time. Hollywood celebrated generations of Irish tenors, including Dennis Morgan, who, it turns out was actually of Swedish descent, with the real name of Stanley Morner. But there is his lilting voice and open face that spoke of Ireland to us nonetheless. Reading this, you may suspect I have a modicum of Irish blood myself. Have a cup of Irish coffee today and think of me. You just might find me in an Irish bar in Hoboken, wearing that boa of dyed-green chicken feathers I bought for the parade two weeks ago. Happy St. Patrick’s Day! Very interesting to see myself this way! In this take, (the second, which I felt it was the better of the two) I get all set to do Southern accents and when I start my attempt at a Hoboken one, I'm still Southern ("Ah think it wuz his energi") Took me a line or two to get into the scene. Maybe I should have memorized it and given you a real show! Better luck next time. Those of you who haven't heard a Mobile accent are in for a laugh. Those of you who have--a bigger one! I can do that one for hours. The phrase education reform has a dull ring to it. No-child-left-behind sounds nobler, but actually turned out to be nothing more than a system to teach the test questions in advance to students who had no other motivation to be in school at all. How about a school that encourages the child's natural curiosity and leads him or her to the appreciation of learning itself? How about a school that teaches botany and biology by actually allowing the child to experience the out of doors along with lessons from books? How about a radical new kind of school that doesn't measure children against one another, but, along with following a set curriculum, offers the opportunity to go as far as possible in the directions that interested him? Does that sound exciting? Does that sound new? It certainly would be radical. In the minds of most experts, it certainly would be impossible. In 1907, when it was believed that mankind was ready for a beautiful new way of looking at things, such a school not only seemed possible, it was ripe for birth. Innovations were being tried in all kinds of unlikely places. Dr. Maria Montessori, a psychiatrist in Rome, began her experimental school in connection with a settlement house in the inner city. 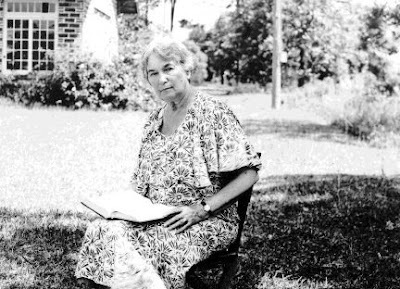 And in the United States, an extraordinary woman named Marietta Johnson began her own school with a stipend of $25 per month given to her by her good friend Lydia Newcomb Comings, in the utopian community of Fairhope, Alabama. That's her above, in 1938, the last year of her life, sitting outdoors on the campus where so many of her classes had been held. Her basic theory to reform the educational system of the day was based on her knowledge as a teacher that children are born loving learning and that school should be designed to nurture that love and not stifle it. She believed that children learn for the sake of knowledge and not to compete with each other or to gain rewards other than the sense of accomplishment from a job well done. President Obama is well aware of what a good education is. “For decades, Washington has been trapped in the same stale debates that have paralyzed progress and perpetuated our educational decline,” Mr. Obama said, in a speech day before yesterday. Marietta Johnson lived in a hopeful time, watching the turn of the last century with the eyes of an idealist. She and her colleagues believed that real reform would actually remake mankind in a finer image, and that education was at the heart of that change. There is a museum dedicated to her work, and her school still lives, in the community where it was founded as a demonstration of what education can and should be. If you're interested in Mrs. Johnson and/or her school and her ideas about educational reform, click on those links in blue above, or go to amazon.com and order a copy of either of my books about Fairhope, Mrs. Johnson, and her school. You're in for quite a trip! Labels: educational reform, Fairhope, Marietta Johnson, organic education, The Fair Hope of Heaven. Last weekend I was in Kingston visiting my daughter and her sons. When Andy woke up Saturday morning he had one idea: He wanted to go with Grandmama back to Hoboken and go see a play on Broadway. As it happened, I had with me the flyer I had got in the mail for the preview of Noel Coward's old comedy Blithe Spirit, hoping to persuade one or the other of my grandsons to join me in seeing the show. At eleven, Andy is a little too young to appreciate much about this endearing chestnut, but when I told him Angela Lansbury was in it, he said, "I've heard of her." After a little shuffling around which included me making a phone call to the box office, shoving my clothes back in the bag I had unpacked the day before, and the two of us scurrying to the bus station to get on the earliest transportation we could, a full-fledged plan had been hatched. We boarded the bus Saturday and headed for New York, with reservations for the matinee the next day. Andy loves Times Square with all the lights. As soon as we got to Port Authority Bus Terminal, he twisted my arm for a little walk around the nabe, and, looking east on 42nd St. he said, "That's what I like! Let's go that way!" so we were off to the tawdry glitter of the big city. I told him about the new stairway at the center of the action, and we made our way through the crowd to walk up the bright new lighted steps. One look and he said, "I thought they'd be higher," but we climbed to the top and looked in every direction. He's right--the steps are not all that high, but the view is grand. By now it was dinnertime, so I took him to a wonderful little Italian restaurant I'd found a few weeks ago when attending the matinee of Speed-the-Plow. Andy is very sophisticated and has traveled to Italy many times in his young life. He debated whether to select gnocchi, finally rejecting it because the menu said the dish contained eggplant, and he doesn't care for it. However, he liked the spaghetti bolognese and I loved being with him in the restaurant with the noisy pre-theatre crowd. Refreshed and well-fed we got on the bus for Hoboken and were home in 15 minutes. Playing with the tv and computer led us to a night's sleep and soon it was time to get ready for his look at a real Broadway play. I tried to prepare him for the talky, old-fashioned, very English play her was going to see, and I told him, "It doesn't get really good until the ghost comes on." When the lights came up on the magnificent set, an English drawingroom with all the trimmings, Andy said, "Is that real?" The play is overlong, and he did get bored before it was over. I thought the cast was superb, and, even though I wouldn't have thought of Angela Lansbury as Mme. Arcati, she played her as a no-nonsense Engish eccentric (I know that's a paradox), and even with a few bumbles in the lines--which Andy said he didn't notice--she pulled off her part with characteristic class and professionalism. The woman is 83 years old! It's a pleasure to see her tread the boards once again. Leaving the theatre, Andy said, "Now I can say I've seen Angela Lansbury!" and when we got home we Googled her so he could see a few moments of her as Jessica Fletcher on Murder She Wrote. I hope someday he'll see her as Elizabeth Taylor's older sister in National Velvet and the saucy cockney maid in Gaslight, and of course when he's older, the evil mother in the original The Manchurian Candidate. He told me he didn't like that ghost in Blithe Spirit. Actually, I can see what he meant. Christine Ebersole, whom I had the good fortune to have seen in Grey Gardens, had a wonderful time with the role, but the character is meant to be a prototype of a certain kind of delightful airhead, not particularly sympathetic. Jayne Atkinson was an extraordinary Ruth, toe-to-toe with everybody, and seemingly carrying the action of the entire play in her competent hands. Rupert Everett could not have been better as George. And Angela made the nutcase Arcati quite delightful. It was an auspicious weekend, and one I hope to repeat many times in the coming years. Don't forget, I have two grandsons. If I play my cards right, I can expect to have dates for the rest of my life! I've written two books about my home town, the utopian single tax community of Fairhope, Alabama. I have the beginnings of an unpublished book which is not about Fairhope at all. Not the least little bit. It's not even about Hoboken. It's about how to have a good life after the age of 60, which I thought would be of interest to all those baby-boomers who dread the passage of time. Apparently I was mistaken, or I hadn't noted how many many books exist for that particular market, some by far better known (and perhaps far more adept) writers than I. The manuscript was submitted two years ago to two different writers' agents, one at a time. The first agent had a couple of partners who do the reading of unsolicited work ("slush," in the trade). Her partners didn't think they could sell it, so she sent it back to me with a kind "no thanks." The second, who is my nephew's agent, asked that I submit 50 pages to him by email, and I did, and he never said anything further to either of us about it. I noticed it about five years ago. I began saying it pretty often. Every time I said it it seemed everybody agreed -- I was onto something. What I said was, "70 isn't old any more." I'm not exaggerating -- the positive response was universal, and anyone can see why -- just look around you. There are young people and old people, but 70 isn't the cut-off point, as we once supposed it to be. At some point, when put on my $10.95 glasses that I bought at the local supermarket, I noticed that the faces of my friends were covered with wrinkles. I couldn't help but wonder if they saw something similar when looking at me through theirs. Here’s the story behind those cheapo glasses – determined not to buy prescription glasses until I'm 70, I alternate between a low-voltage pair for viewing television and night driving and a high number pair for reading and seeing stuff up close. I don't wear them for lunch with friends, but I slip the high-number Ben Franklin pair onto my nose for reading the menu any time I’m in a restaurant. A few years ago Oprah Winfree noted on her talk show that she admired how Diane Sawyer, a few years her senior, was handling being 50. Oprah vowed before her viewers to do it as well. With characteristic determination and focus, she managed to look better at 50 than she had ten years earlier. If she maintains her commitment to staying young and attractive at the rate she's going, when she gets to her 70’s she'll probably look about 20. This book is for those who would like to think and feel differently about the coming of the once-dreaded decade. It is a book of personal experiences by someone who has done all she can to ward off oldness, and intends to continue even if she dies trying. Don't remind me that I probably will; that's beside the point. The point is, although life is full of land mines and booby traps, its very complexity promises that it can be rewarding at any age. This is not a book of advice or rules of good living. It will reveal some situations you might encounter and some stories from which you might learn, but its main purpose is to explore, from the vantage point of one who is there and enjoying herself, how the other side of sixty is different and how it may be the same,. Approaching 70, we are old enough to have amassed a backlog of prejudices and preconceived notions, some of which we'd be better off without; this book may well help in determining which you should keep and which you'd be better off without. I am well aware that at my age most people are half of a couple. Their decisions are made as a committee of two. Their investments (in time, energy and money) are also made jointly. I have been part of a couple – three times – but have been a widow for over six years now, and am by now beginning to enjoy my autonomy and freedom. Learning to live alone, however, is a lot like learning to live with somebody. For one thing, it's not as easy as it looks. I had a perfectly wonderful year when I was 61. Because my birthday is in May, this spanned two calendar years – 2001 and 2002. The shattering horror that occurred during that period, said horror being when the twin towers of the World Trade Center were destroyed on 9/11/01 was made bearable by the fact that personally, good things were happening to me that year. Up until that time I had always said that my favorite year was the one when I turned 11. My second favorite year -- at least as good and probably better -- was the one that came 50 years later. There is something astonishing in that. There is much that is hopeful in this book. Maybe it's because 50 is the new 30. Maybe 100 is the new 90. But very few people of normal good health seem really old at 70. It may be said that those of us pushing 70 are trying too hard, but it seems to work. I will try to tell, not necessarily how you might cope, but how I have. I wouldn't say my style would work for everyone – I tend to err on the side of risk, as you will see. However it is, it's been a good life, and it's getting better. If you stick with me I just bet you’ll enjoy the trip. I have some chapters in folders, and all on my hard drive. Maybe I'll get back to this one some day, or maybe I'll just run a smidge or two on the blog from time to time. I'll see if you like it.